Sports cars are the aspirational vehicles of the auto industry, and autoMedia.com jumped into three of the best to compare and contrast their abilities. The article, Comparison Test: Jaguar F-Type, Chevrolet Corvette Stingray, Lotus Evora, puts this impressive sports car trio through their paces. With new technologies available today like smart suspensions, active exhaust and super-fast transmissions, sports cars may be better now than ever before. The three vehicles in the new autoMedia.com comparison benefit from a litany of tech goodies, as well as their inherent traditional sports car abilities based on lightweight materials, aggressive engines and dynamic handling. The autoMedia.com article examines these three sports cars and highlights their differences. Still, for all the ways that the Evora, Corvette and F-Type are different, they all share the ability to put a huge smile on the face of their driver. While the three vehicles featured in the autoMedia.com sports car comparison are all hot new models, they are also steeped in rich history. The 2014 Chevrolet Corvette Stingray traces its lineage - and its name - back to the 1950's. The 2014 Jaguar F-Type is a curvaceous callback to the iconic E-Type of the 60's. 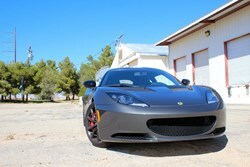 The 2013 Lotus Evora S embodies all of the racing philosophy of legendary designer Colin Chapman. Each has taken different paths in search of providing the ultimate driving experience, however. The Corvette Stingray is a front-engined two-seater with a seven-speed transmission, while the F-Type boasts an eight-speed transmission and is available only as a convertible. The Lotus Evora S employs a completely different approach, with four seats and a mid-mounted V6 engine. Their differences are what make these sports cars so enjoyable. Each feels differently when hands are on the wheel and feet are on the pedals, and there is certainly a vehicle here to fit every enthusiast's desire. Simply put, there isn't a wrong choice in the group. The Chevrolet Corvette Stingray, Lotus Evora S and Jaguar F-Type are at the top of their class today, and will inspire the next generation of sports cars that eventually take their place as modern day classics. “There is a lot to choose from, and autoMedia.com is here to help interested buyers make the right decision,” said Hamlin.